Cycle World Magazine recently reviewed a VH-55, and they liked what they saw. Even if you own a pickup or a van large enough to hold one or even two motorcycles, a VersaHaul is still a good idea. For one, it's easier to load, especially for shorter people. Plus, the bed or cargo area can then be used to carry other stuff—like more bikes. You can read the Full Review Here. And thank you to Cycle World Magazine. We're glad you liked it. Cycle World's Steven Natt had us on his radio show to talk about our sport bike carriers after we wow'ed him with our VH-SPORT. "Because of the various features, the strength of it, and the ease with which it mounted and set up, I think you guys nailed it on this one." You can listen to the interview here, or check out their podcast (link requires iTunes). Thanks to Cycle World for having us on the show, and we're glad you appreciate the superior design and quality of the VersaHaul line of sport carriers. Eastern Dirt Magazine ran a review of our VH-55. Mike the intern gave our carrier a spin on a four-hour trek, and he gave us another rave review. After that first half-hour, when I finally realized that the little motion that was going on back there was all that was going to happen I all but forgot about it! I set the cruise at 75 mph as usual and was home in no time! Check out the full review in Eastern Dirt Magazine! The VH-50cc is a lightweight addition to our ever growing product line. 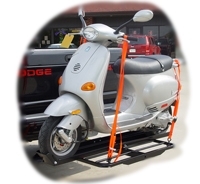 This carrier is designed to better suit those individuals with the desire to carry small scooters without the cost of a larger, heavier motorcycle carrier. Click here for more information. The VH-SPORT is our strongest motorcycle carrier yet. Rated for a 600 lb. 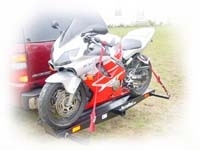 sport bike, this carrier will surely appeal to you sport bike enthusiasts! Now take the fun with you on trips, vacations, etc... Click here for more information. VersaHaul also offers the VH-MS, a mobility scooter carrier. 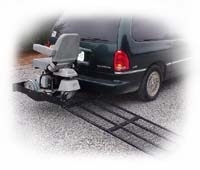 This carrier is designed for those who wish to take their mobility scooter with them on trips but do not have the room to put the scooter in their vehicle. Click here for more information.